Just a quick note to say we're heading to AIRECON. It's a medium size gaming convention in Harrogate Friday 8th-10th March. It has a small trade fair and seems to be mostly groups of folks playing games. There's a big library of games, but we might take some of our own! Mrs_Decar, Rich The Fish and I are heading there on the Friday, staying over in a nearby hotel. We've not had a favourtism poll for ages and ages and with all the talk about Spiel Tiles, I thought it would be a good time for people to vote of their favourite. 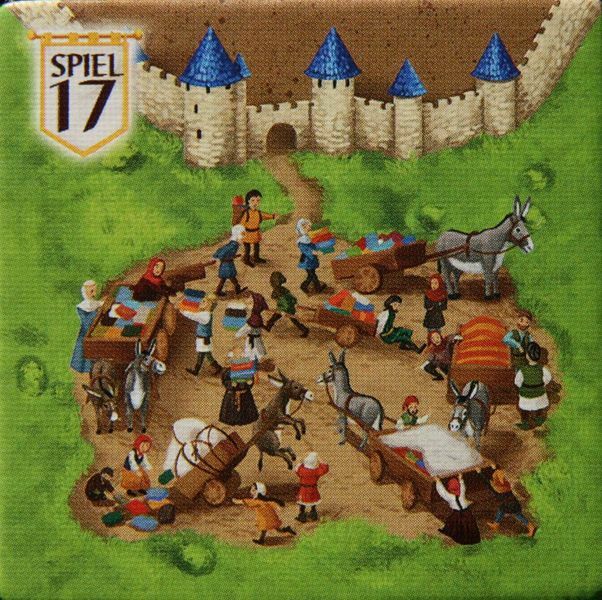 Spiel tiles have been given out since 2014 at Essen Spiel when making purchases at an HiG booth. 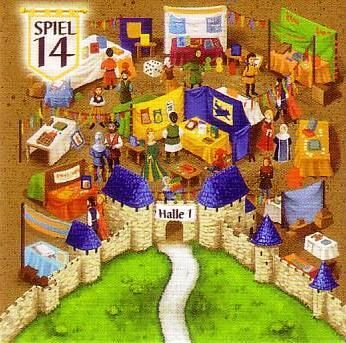 Back in 2014 (it seems like only yesterday), the first Spiel Tile depicting a gaming Hall and HiG's booth in the centre was put on display in a CCCR tile. In 2015, we saw a really useful RRRR tile where the local towns folk are playing board games. I wonder how many travelers stop for a quick game or two. In 2016, we see two knights fighting in a CCCC tile. I think this might be the first time HiG have released a tile in this configuration, with only a single city placement. I doubt I'd ever place a farmer in that one-city farm it produces. I find it very difficult to decide between 2017 and 2018. I love the statue in 2018, but I also love the chaos of city life captured in 2017 and the comedic value of the donkey floating in the air. So 2017 gets my vote. Which tile do you like the most? Do you use them in your games? Have you noticed any nice things going on in the tiles? Voting is open for the next 7 days, but if you're joining us late, feel free to post your opinions! News and Events / Goodbye & Good luck Udo Schmitz!! But TheSteveAllen is attempting to, in his words on Slack: "stick with a game until I feel like I understand it well enough to be able to give a good game to a regular player"
Which made me think, what ten games best describe the hobby? This is somewhat different from your favourite games, as it allows you consider games you might not like, but you know are solid designs. I feel my selection may be tending on the older games, but I feel all of these titles stand the test of time. What 10 games describe the hobby for you? 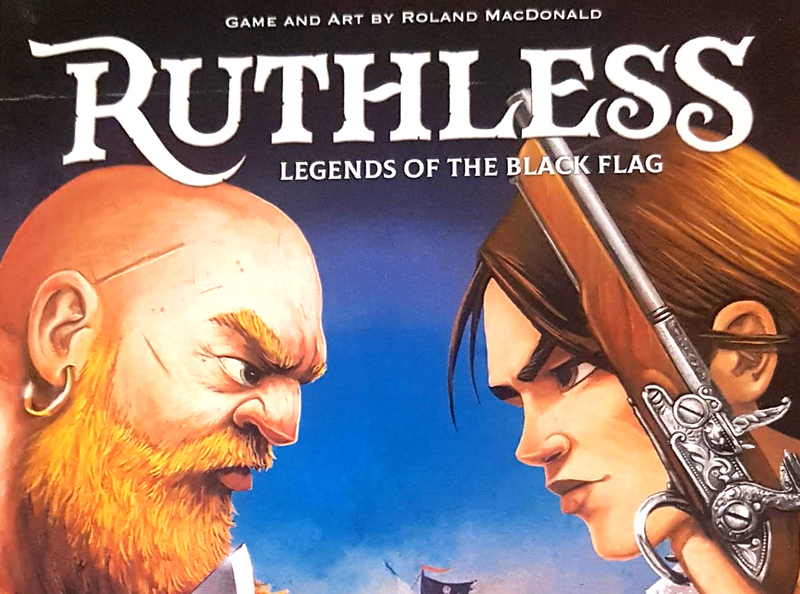 We’ve been lucky enough to be sent a review-copy of Ruthless: Legends of the Black Flag by Roland MacDonald (published in the UK by Alley-Cat games) a couple of months before its release. Roland MacDonald is a highly accomplished artist having worked many years in the computer-game industry and has an impressive resumé of credits. He’s now turned his attention to game designs. I believe this is his first title to be picked up by a publisher, though he has self-published a few smaller projects. Rich the Fish has followed his work for a number of years, and I became aware of his talents when Roland self-published the Reiner Knizia classic ‘Battleline’ in a limited print-run. This classic finally got the attention to detail it deserved; the end result was phenomenal. 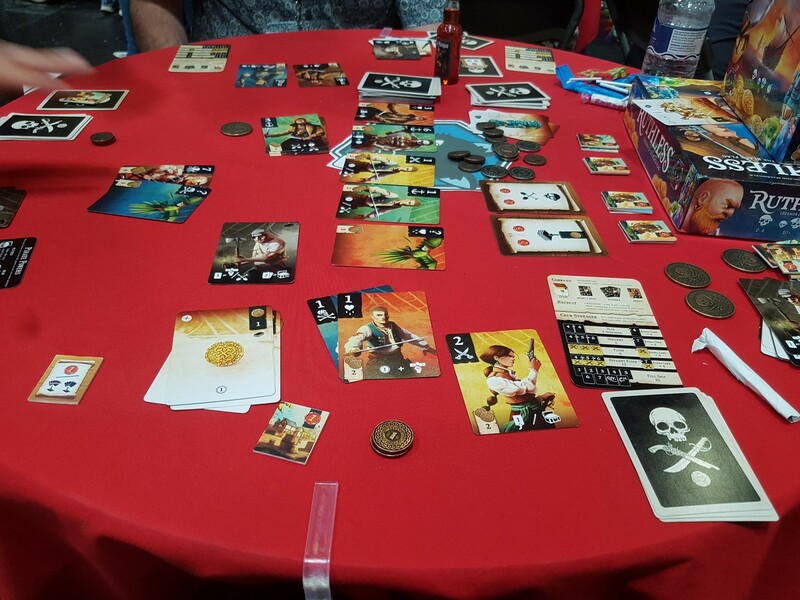 Thanks to Rich the Fish, I was fortunate enough to sit down and demo Ruthless at the UKGE 2018 and have the game explained by Roland. If you’re read my write up, you’ll know I was impressed, but Rich got in contact with Roland and he was kind enough to send us a copy. So a word of warning: The copy I have is a prototype, meaning components are non-final. I’m aware of a few minor tweaks, but the end result shouldn’t be too far off. I’ve also included some Legendary metal coins that are not included in the game. Roland was also kind enough to send us some prototype play-mats that are not included in the game, but an additional purchase. Bear this all in mind when you’re looking at my photos! You know what I like from a game. You all know I like straight-forward games. Most of you know I like deck--building games. Some of you know I like pirates too. I don’t know any personally, but when it comes to anti-establishmentarianism and accessibility-for-all, pirates are leading the way. There’s a world of opportunity, and pirates know how to make the most from it. You could call them the first ‘adventure capitalists’, if it wasn’t for the rum of course. I’m a big fan of abstracts and rarely care for theme, but Ruthless is somewhat different for me. But I find all the bits that make up the game have been interwoven tightly. The game has balanced delicately the mechanical implementation with its thematic components. For me that’s a big deal because usually they offset each other; here they work together. On top of all that it’s wrapped in a wonderfully engaging art-style and has clear and precise iconography. 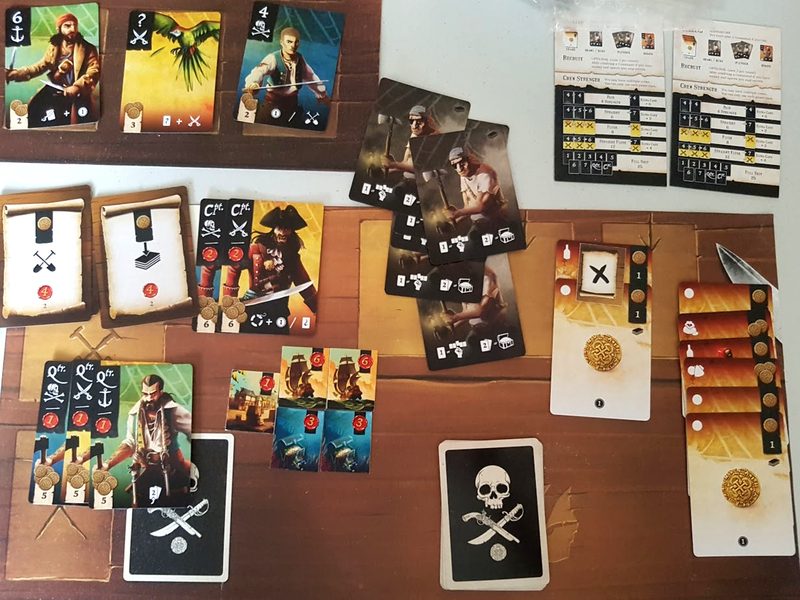 Like a traditional deck-building game, every player starts with a starter-deck with some low-value treasure cards and some weak inexperienced crew, namely ‘Powder-Monkeys’. 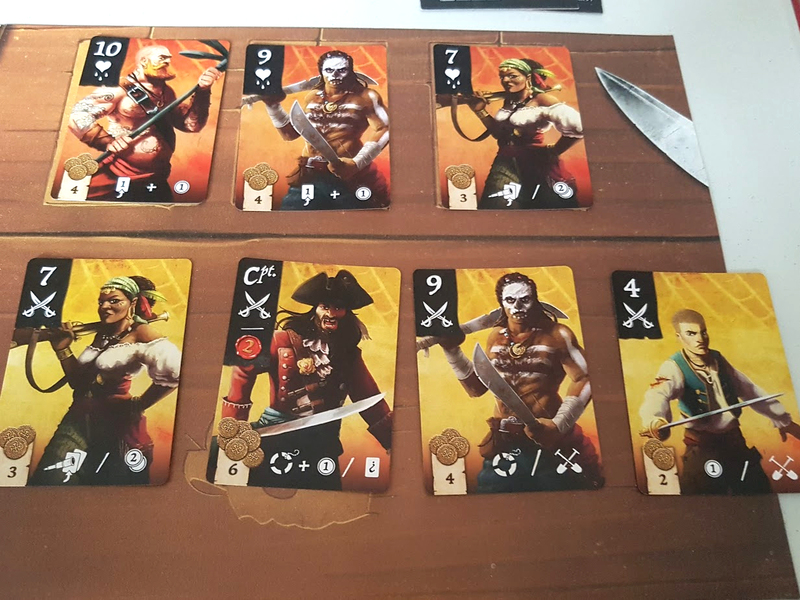 In front of all the players is the familiar ‘buy-row’ containing pirates you’ll be recruiting to join your deck. Treasure cards are available in another deck, which you can obtain through plundering. Both these card types will ultimately end up in your deck. 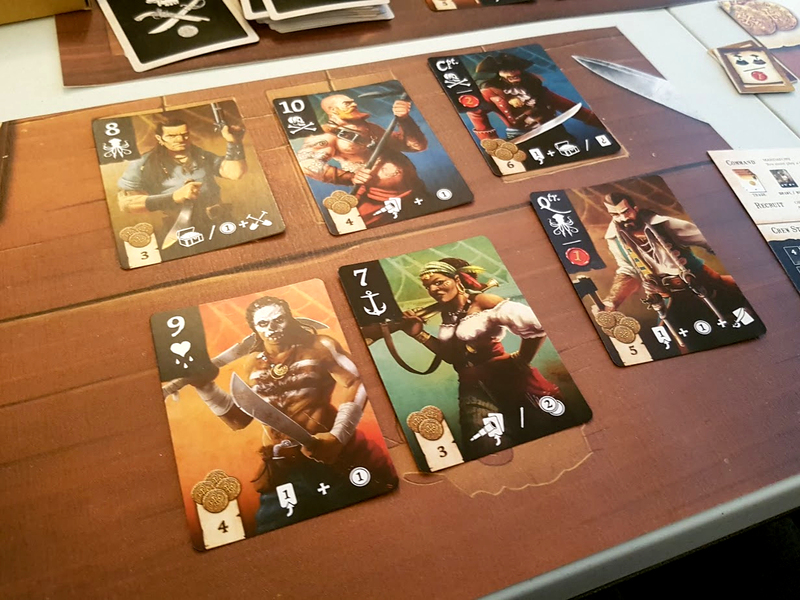 During round you’ll be using your hand to form a raiding party, which means grouping the pirate cards you acquire and play during a round in such a way as to maximize their raiding-strength. This is pretty elegant and works by building pairs, straights and flushes which is all pretty intuitive. The Pirate cards have a variety of special actions, but they also belong to suits of cards: (Hearts, Skulls, Anchors, Swords and Kraken). There are 10 cards in each suit: 1-7 (4-10 in my prototype deck), a Parrot card, Quartermaster & Captain. Bury - Equivalent to trashing cards from your hand or discard pile. Plunder - You can use 2 Powder Monkeys to pull the top card from the treasure-deck. Board - Allows you to play a pirate from your hand and perform their special action. You may then Recruit, allowing you to spend the gold you’ve accumulated to hire a pirate from the Pirate-Deck (‘buy-row’). But, you may only recruit 3 pirates in a round. The boarding actions are where the meat of the deck-building lies. When you recruit a pirate, you may take their action immediately. This offers the player’s some hard decisions. I’d like to recruit the 8 of Swords so I can get one more coin and bury a treasure card, but the 8 of Hearts is also available and that will score me a flush at the end of the round. 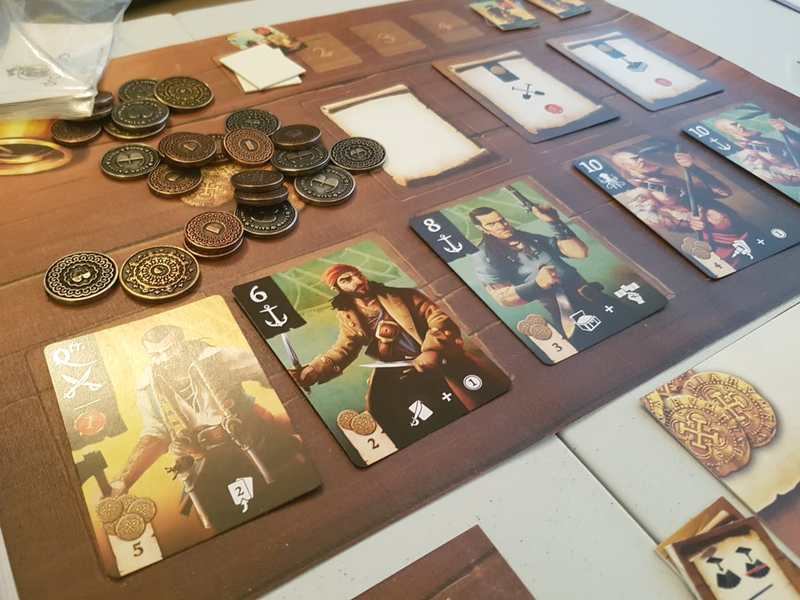 It can be really tough knowing where to invest; weighing up short-term and long-term goals against your opponent..
It’s really rewarding trying to work out how best to use the pirate cards to maximize your scores. There are some familiar traits founds in most deck-building games. Do you invest in cheap cards to win some easy points, or do I hold out and invest in the more expensive cards which allow me to top-deck or rescue cards the cards I’ve already played to the discard? The Treasure cards which you acquire through plundering (which we’ve taken to calling Plunder-Monkeys for no good reason) can be used in two ways too. They can be cashed in immediately for a reward, or you can add them to your discard-pile then hope for a bigger payout later. Cash flow is important. Attack-cards can be played to make you return a coin to the supply or discard a valuable card. This can be gruelling when you are trying desperately to save up for a valuable purchase. 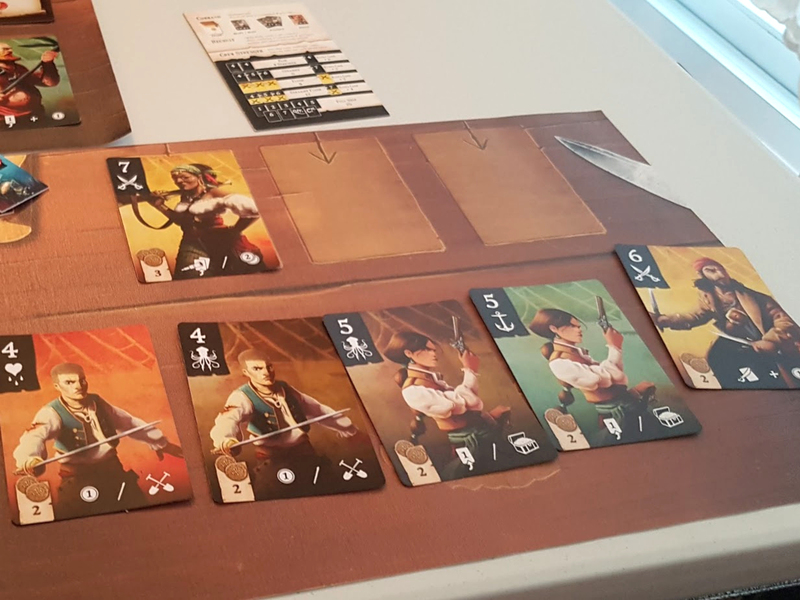 Deck management is tough in Ruthless because there are only 5 rounds (6 with 2 players) and given you will be drawing 5 cards each round there is a really high chance you might not see the cards you were hoping for. But burying cards is one of my favourite actions. It’s another familiar mechanic in a deck-builder: trash weaker cards to streamline your deck and allow your hands to be more predictable. 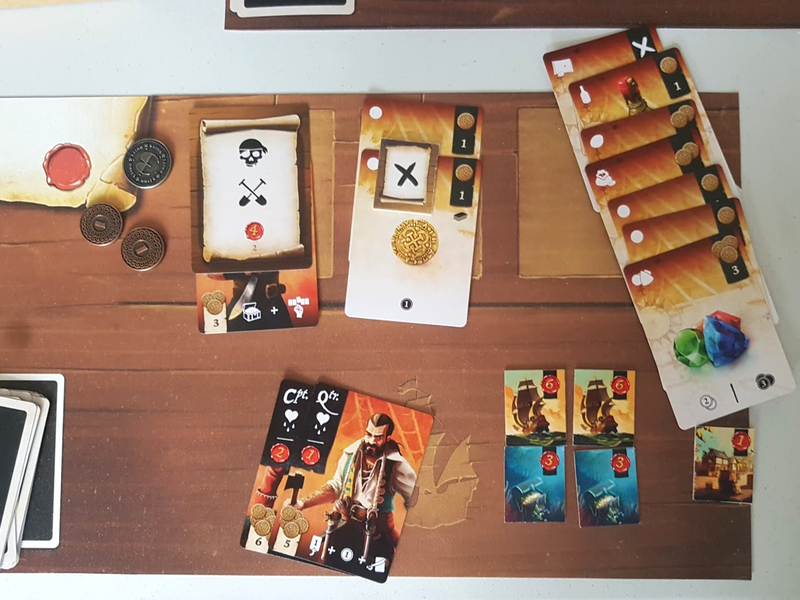 In Ruthless however, buried cards can be put towards scoring end-game rewards; as an example, one gives points to the player who buried the most treasure. Now rather than simply trashing rubbish cards, players are given another route to victory and they have to determine when the most suitable time to do this is! This is precisely what happened during a game I played with my wife. She had removed some of her starter-coins from her hand to thin her deck, I saw this and I decided to bury rubies. As a result, I managed to achieve a tie-break at the end of the game. As I said before, Burying and Plundering cards also gives the players choice: If a hand is particularly bad, players have the option to invest in the legendary achievements rather than building the best raiding party to earn 6-points. The alternative could be to maximize the treasure in your deck or spend the turn burying cards, which could win you 8-points during the end-game scoring. Recognising when to do this feels a lot like a trick-taking game, especially during 4 player games. The majority of the game I’ve played are 2-player. I’ve enjoyed trying different strategies to win games. Ruthless supports a lot of strategies that you’d find across the deck-building genre. The pirate’s boarding actions seem limited but can all be used to manipulate the deck expertly. As an example, I purchased a 7 of Swords to take the top-deck action: draw 2 and take one. I was fortunate enough to select a Captain of Swords, that I could play next round to rescue a card from my discard pile. I saw a great combination by pulling out the 9 of Swords, who, next turn, allowed me to rescue the 4 of Swords. A flush of 4 cards is a high scoring hand and I was able to make sure of the final Bury Action to remove a treasure-map (-1 point) from my hand when scoring at the end. Ruthless is full of small smart exchanges like this and although this was one of the longest combinations I’d managed to execute, it is significant to note that my opponent had turns during each of my plays. This blocks those +5-buys or +5-attacks leaving a sour-taste found in a lot of deck-builders. There will be rounds where you seem to not draw the cards you need, nor be able to generate quite enough gold to get the crew you want and this can be difficult at times. Understanding this has gotten easier with more plays, I now find sometimes saving money for one turn grants you access to some powerful cards that can be crucial later on. The game attempts to counter this in two ways, during the first two rounds building raiding-parties only gives you 1 point, as opposed to 6 in later rounds; simply because you should invest in deck-building. The other counter is more strategic. At the start of the round, if a player pulls a particularly bad hand, they may use the parlay token to discard and redraw. That in itself is simple, but what if I know there’s a good chance of a rescue-action to pull back a card just discarded. This isn’t a free action though, an unspent parlay token is worth a point at the end of the game. For a simple-game, there is a smorgasbord of options. At 2 players the game never overstays its welcome and with a quick setup we can now blitz through a game in 25-30 minutes. At time my wife felt like she had no chance of winning, but we’ve found the biggest point margin to be only 5-points. I’m pretty sure an alternative play by either of us would have meant the game going the other way. What we like is that all the different strategies available to us seem comparable or comparative with one another. Potential Spoiler Warning: The treasure deck contains dubloons, precious gems and an array of ancient artefacts. Typically, the treasure-deck will grant at least 2 gold when the plunder action is taken. I happened to need 2 gold to purchase a very important card before Rich The Fish could during a make-or-break moment. I was fortunate enough to have 2 powder-monkeys in my hand. So off they went to find me some buried treasure. I drew the top card of the treasure-deck. My minions had returned with a potato (aka Yukon-gold), a measly potato, worth a single gold coin. I guess you had to be there, but I didn’t expect to go treasure hunting and find a potato. It was hilarious, this push-your-luck element really made me laugh. Having spoken to Roland about it, he said this card almost didn’t make the final cut, as some players wouldn’t like it. For me though, it was a wonderful demonstration of Roland’s thoughtful design and it made me appreciate the push-your-luck nature of treasure-hunting. I still think those Powder-Monkeys may have been holding out on me...you’ll be happy to know they went to see Davy Jones soon after. Obviously, we were playing a prototype, so I can’t review the final card-quality and other components. There are two things that I can talk about: The Rule book (on BGG) and the art work (and iconography). The Rulebook - The rules are concise and to the point. There are enough examples provided to mean I had a good understanding of how to play without needing the cards out in front of me. Similarly, I didn’t need to get the rules out to set the game up and make sure everything had been done correctly. It’s all straightforward. But having the designer introduce you to the game at the UKGE has probably helped here. I’ve still needed to pop back to check for certain situations, like tie-breaks though and I’ve found the layout and formatting is easy to navigate. Most importantly, I’ve found I can remember what I’ve read, which is always a good sign! The Art: Honestly, I don’t feel qualified enough to talk about the art in this game. It’s simply gorgeous and there’s a ton of it. The 10 buccaneers manifest a fearsome crew; they ooze character. Similarly, the treasure cards demonstrate an attention to detail which separates Ruthless from its peers. For example, the aztec statue has pockmarks and wear, which subconsciously makes us assign history and worth to the artefact. All of the art is vibrant and colourful and with the careful use of colour and layout-designs nothing feels confusing, distracting or cluttered. The iconography is intuitive too and the decision to include a player-aid helps reinforce everything found in the rulebook. The only other thing I should mention here is about the decisions made for components. The prize tokens are a great way of summarizing each round. Legendary Achievements are selected at the start of the game and provide different ways to focus end-game scoring. This gives the players some direction and means that specific winning-tactics are not always guaranteed to succeed. The use of cards and tokens are simple additions but provide good structure to the game. Deck-building is quite a varied genre. I find Dominion is pretty complex and it’s been on the street long enough to provide an almost endless range of combinations to play. I usually find that understanding a few basic strategies can mean an easy victory over a new player. This causes two issues: i) No one wants to play with me anymore, ii) players have to invest a lot of time to improve their skills. For some that’s worth-while, complexity isn’t something we should frown upon. Ruthless is a more direct affair. With the help from the player-aid, newbies at least know what they’re aiming for, even if they can’t immediately penetrate the versatility presented within Ruthless’s cards. There’s also just a chance that new comer might hit a powerful combination and strip a master of a necessary 3-point lead at just the right moment (or wrong moment for the master anyway). There is also a trait in modern deck-builders to focus on selecting cards that enable long and powerful combo-chains that inflict damage against targets, like the *-Realms franchises for example. There’s countless multiplayer solitaire builders which shun almost all direct interaction. In contrast, Ruthless focuses on maximising each round, which, though subtle, means that all players are in the game until the very end. There’s an opportunity to reset. The round structure enforces plays to be reset enabling even the weakest players to try again. As I described earlier, giving the players multiple fronts to invest in provides many different routes to end-game victory. Ruthless feel like a game that’s always been here. It’s a warm and friendly gaming experience, it feels trustworthy. Granted there are no ultra-new hipster mechanics but instead I see careful use of existing ones. This is a deck-builder built on heritage of poker-hands, push-your-luck, hand-management but it doesn’t over do any of those parent mechanics. For me, Ruthless always feels welcome at the table, in the same way that games like Carcassonne and 7 Wonders do. Key for me is that Ruthless is accessible. The rules are quick, easy to explain and easy to remember; but there are nuances that more experienced gamers can experiment with. Ruthless feels like a game that’s carefully watched its peers, taken the most suitable bits and then carefully rounded off the edges. I think that’s most evident in the classical Raiding Party construction and the intuitive action choices. 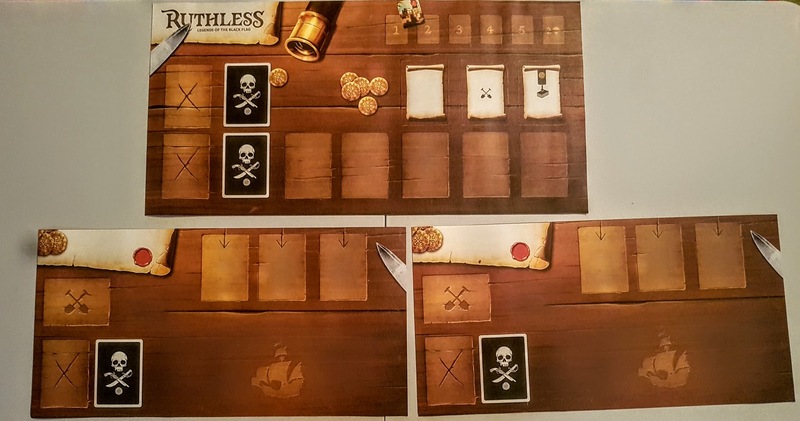 Ruthless: Legends of the Black Flag is available to pre-order and Alley Cat games scheduling an October delivery; but I’m secretly hoping it’ll be here in time for International Talk Like a Pirate Day: 19th September! Best of all, Ruthless has been given a sub-title….so I’m hoping for more subtitles in the Ruthless license soon! I’ve really liked using these. Even though it’s a luxury item, it has help embed the theme even more. 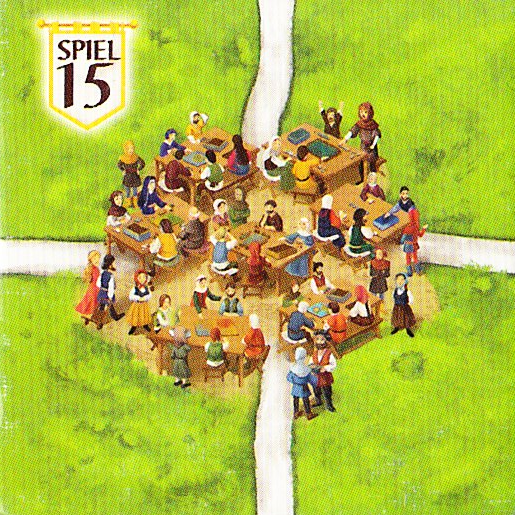 The communal tableu makes it easy to set the game up and manage all of the rounds and cards during play. The player boards are nicely laid out too, I particularly like the home for the new-recruits which might become lost otherwise. I was skeptical because I thought the canvas mats would wear too easily, and though they are showing signs of wear, this seems to give them character. Much like the captain’s table, the tiny dings and dents entrench the players into theme. I never thought I’d say it, but good components really do enhance a game. These coins have a subtle design and work well for this game. I particularly like the weight and size of the coins. No doubt you’ll be seeing these in future photos. A website called Game Crafter allows people to upload component designs and boardgames then sell their bits and bobs from the site. I've not used the service - but I suspect some folks on the forum may be considering making me some custom Decar Meeple for my birthday next year, I thought this might help them! For those of you who don't know: GenCon is the largest tabletop-game convention in North America by both attendance and number of events. This year is going to be a little different from previous years - so I wanted to give you a head start and the possibility of subscribing to this thread, so you can get updates ASAP! Those who recall in 2015 we attempted to break the high-score using a Carcassonne base-game. This year I will be sharing The Knave of Carcassonne - another very different solo variant [which also contains rules for a 2-players]. I'll be uploading the rules on Wednesday evening to give everyone the most chance to learn and play this new variant over the weekend. Just like last year there will be a small contest and prize draw. You will also get an additional entry for posting all 3 variants. To post on Twitter you must include: #GenCant2018 #Carcsolocon @Carcassonne in your tweet. In addition: The highest scoring individual of The Knave of Carcassonne will win a prize. Keep your eyes peeled for The Knave of Carcassonne! I got to introduce Carcassonne to some folks at work today. Feel free to enter...or post your photos on this thread below! News and Events / Coffee, Cake and the future! We have just completed a 2 hour meeting with Moritz Brunnhofer, where he explained his directional intent for Hans im Glück. Hans im Glück is in the process of reviewing how their games reach the masses. 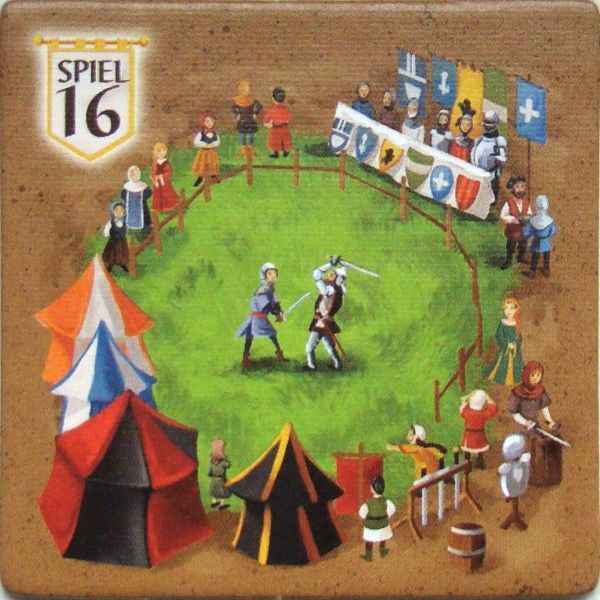 As you sawon Monday it was announced the German distributor has changed from Schimidt Spiele to Asmodee as of 2019. Moritz explained this was by no means an easy decision to make. It has taken him a very long time to decide. Moritz understands that games are more than just cardboard - they are about good experiences. He sees events as a key part Hans im Glück moving foward. This allows their games to be enjoyable and engaging experiences. It is important for them to work down the distribution chain to reach FLGS, rather than simply trying to cash in on the E-Commerce culture, which Hans Im Glück consider to be a dangerous spiral of lower and lower prices. On a related note, yesterday Mortiz explained that he would rather pay more to make sure workers in factories are given reasonable pay for their work. He considers this his responsibility for the greater good. The alternative is to use ´slave labour´ from other countries who could produce items which cost a lot less. But anyway, back on topic. Moritz was grateful for the work carried out by Carcassonne Central and Carcassonne Forum as a mechanism that has promoted the game for so long. He will be making sure we will be engaging more closely in the future. Moritz has asked me to collect your ideas. What would you like to see? He understands that events are the key to producing memorial gaming experiences which focus on friends and families engaging with each other. He is considering collating a pack that can be shared with local game stores to promote the game. 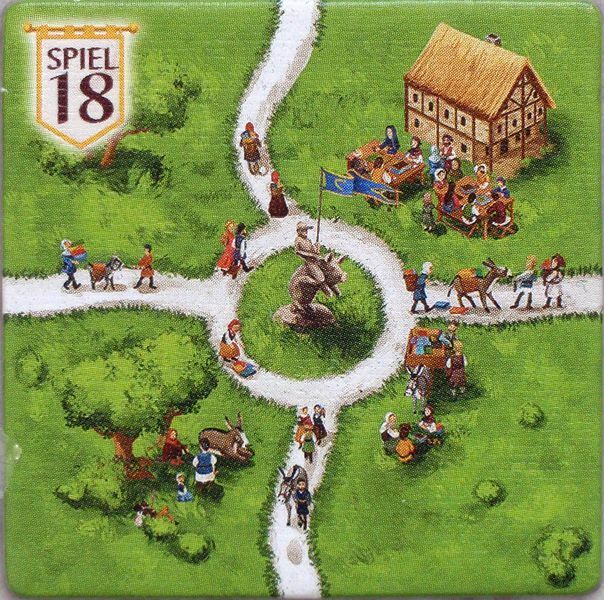 This could be running small contests, or fun ways to play carcassonne to introduce more players to Hans Im Glück games. Using Carcassonne packaging to direct people to a central website eg: CarcassonneEvents.com and from there branch out to othersites, such as our own for more information. Perhaps a note in the rules, or the box to direct them to our forums. Can Carcassonne Central Tournaments be a way of accessing the World Tournament. On this note we must remember that elite Carcassonne is important, but we need to focus on encouraging new players into this wonderful world. This is a very brief post, but I hope you get the idea. I for one was very happy to see Hans Im Glück engage with the community. I felt they have been extremely open about their latest decisions. I did not obviously take notes during the meeting, so a lot of small things I have not covered, but Hans im Glück understands there is a fundamental need for humans to meet each other, in the pub or the cafe or wherever, and they feel Hans im glück can enhance these human experiences. If you were hosting an event, what would the event be? What would you need? ... HAVE TO GO NOW IT´S DINNER TIME!!! It's been a very long time since I suggested a tournament, but I was having a chat with TheSteveAllen yesterday over on Slack and struck upon an idea. What if one player was trying to score as many points as possible, while another player was trying to deny them points? Rather than both players scoring and denying points, you'd each have one focus. As I said above, the tournament would be played as 1v1, where one player is attempting to score points (the fugitive), while the other is attempting to reduce their total score (the trapper), either by trapping or claiming features before their opponent can. After the game the fugitive's score would be recorded. If there are several people interested then groups can be created. In a group each player would be the fugitive against all the other players. The winner of the group would be the player with the highest average fugitive score. In terms of format, players would play 2 games, one as the fugitive, the other as the trapper. If you'd be interested in taking part in such a tournament, let me know below! I think most people know about the new Carcassonne Spin-Off from the Around the World Series is continuing this year with a Safari theme. But we've not started a post about it yet! Next I got to try another one coming out but it is in early prototype forms. It is a new Carcassonne game called Safari! New to me! In this game you will find a lot of familiar things to the Carc you know and love. There is a new way to score though. You will be looking for different types of animals in a given region. There are added jeeps that will give additional incentive and points for placing where they are. What changes are the cloister type buildings give you tokens and the tokens are used to form groups of different animals on the board in desert areas. This part was clever and interesting. i was confused on it for most of the game so I lost horribly, but it was of course very good and I love Carc games in general. I found it to be unlike any other Carc game I played. Still doesn't hold my top most interested to play Carc though, but I would happily play anytime and look forward to seeing the final result! We already have a post about the UK Championships being hosted at the UKGE, but wanted a separate post for this.